2 or more: $6.81 ea. Babo will protect you. Having a bad day? Someone giving you a hard time? 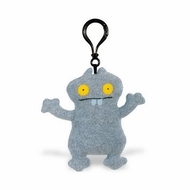 Babo's got your back. What Babo lacks in mind power, he makes up for in love. He's everybody's best friend. He will stick with you to the end and when something scary happens, he will send you a nice greeting card from wherever it is he runs away to. A very curious, mischievous creature, Babo may need some guidance and parenting, so make sure to bring him with you to as many places as possible. Leaving him at home is fine, but please put all cookies and money on the highest shelf.